It seems like chance meetings in the art community become friendships more often than not, especially with stationery. This couldn’t be more true than in our relationship with Susan Hazel Rich. One wintery day two years ago she stopped into our shop, showing off some samples. Our retail extraordinaire, Susan, took a few looks, left a note for Abbey stating “You must see this!” — and now we’re all buds! 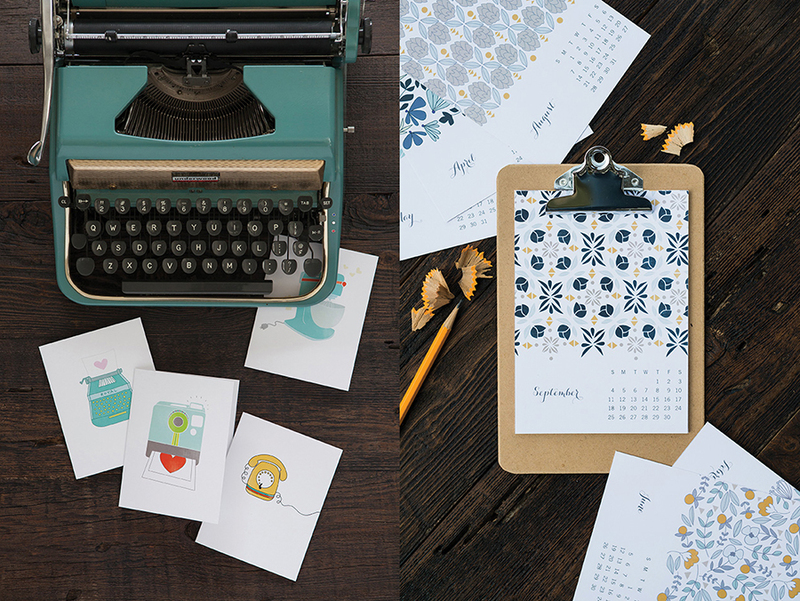 It’s been such a pleasure getting to know her approach to stationery and design, her love of paper and pen, and how whimsically she brings outdoor elements into her creations. Her relationships, pen-pals, vintage textiles and her perfectly tucked away cabin in the woods feed her inspiration. We’ve watched her grow from a passionate artist to the determined business owner behind Hazelmade. 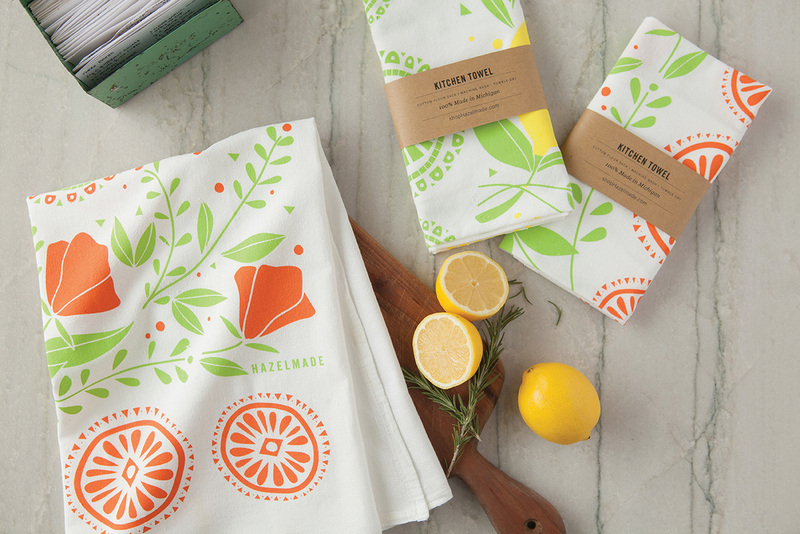 She was a busy girl this year, developing her wholesale line of illustrated paper and home goods, coming out with her first catalog, and coming along with us to NSS this past May. Now her work is popping up in stores around the country – including our own! Here are some of our favorite Hazelmade products. 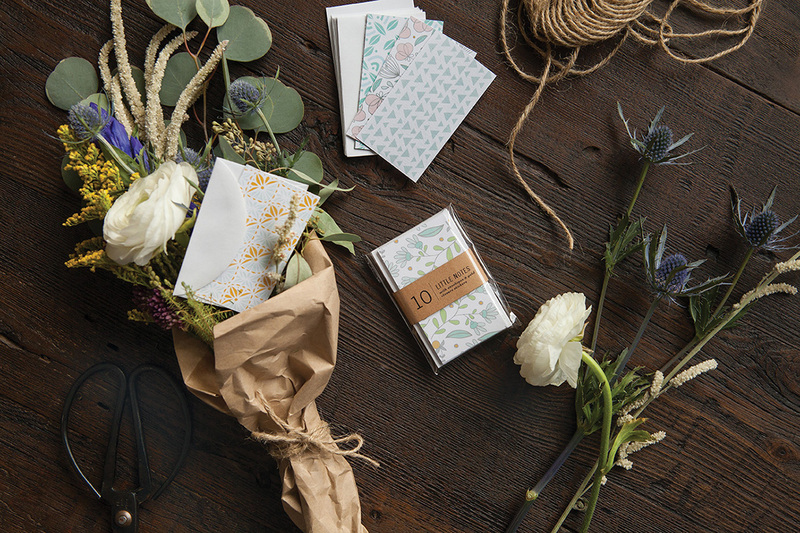 We LOVE, LOVE her mini notes too – perfect to sneak into a lunch bag, suitcase, or pair with a beautiful bouquet. 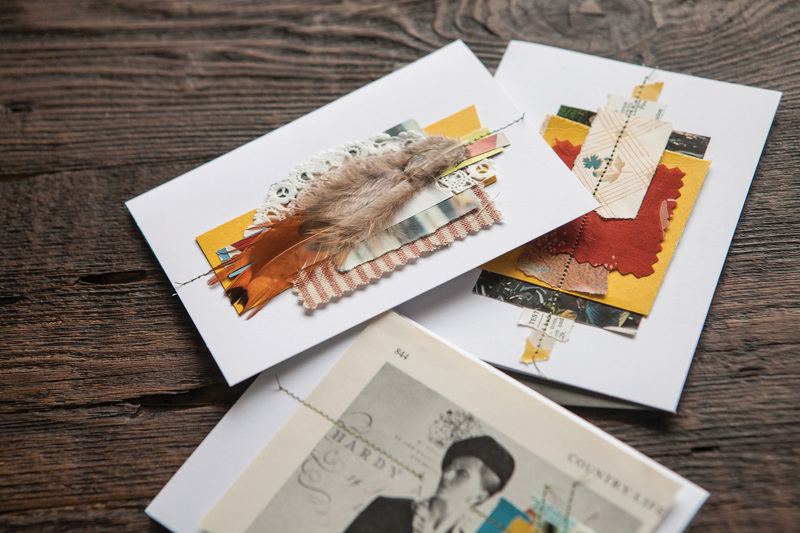 Hazelmade’s one-of-a-kind art cards really stand out in the industry as they are not printed but each individually sewn and glued together as a collection of found objects, illustrations, and scraps of fabric and papers that after sent are perfect for framing. In addition to stationery, she creates amazing tea towels, clutches, bags, and unique sewn gifts. We are so thankful to have been a part of her journey and are excited to see what 2016 has in store for Hazelmade! Gift-giving is all about thoughtfulness and making the receiver feel treasured, and we believe this begins with the wrapping paper and bows. Nothing excites like seeing your name on the most beautifully adorned gift under the tree. So set the tone for the holiday season by choosing a color palette or motif and have fun decorating your gifts! Susan: Do we have wrapping paper, or what? I grew up helping my mom wrap Christmas presents and while I was not especially particular at that time, my tastes have changed. Now I want the look, the feel, just the right ribbon and the perfect tag — you would think I am looking for an Olympic rating. 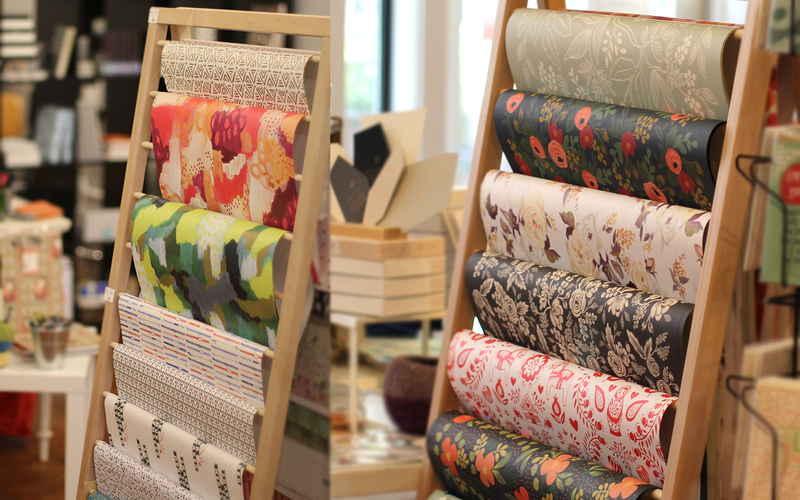 This year we have so many papers to choose from it is hard to narrow it down to two but both my favs are from Smock. One is a silver evergreen branch that feels like sin and screams out for a deep Merlot color ribbon. Second is the station wagon with a tree on top of the car because this is exactly what my parents’ car looked like back in the day and it makes me smile every time I see it. Tarah: Well, since Susan stole my #1 fav this year (the station wagon carrying the tree) … I am always drawn to natural looking papers that pair well with evergreens or big red bows. I also love Rifle’s winter white and soft spearmint blossom sheets because you could put this with any bright-colored ribbon for a real pop. It’s just a classy, sophisticated looking paper to me. For kiddo gifts I love Snow & Graham’s colorful elf wrap, so cheery and fun with their bright, long jingle bell hats. This paper is sure to bring a smile and get a little one excited about what’s inside! Abbey: Every year I have a different holiday color palette with my tree and gift wrapping (Truly, I decorate the tree with cheap balls. I have a handful of colors that I just switch out each year). I just love incorporating bright, unique giftwrap into my decor. Moglea’s wrap makes a striking addition to to any tree – especially when their colors coordinate with your decor. Our very own 6.25 Splatter Paint Gift Wrap as seen in HGTV’s December issue. 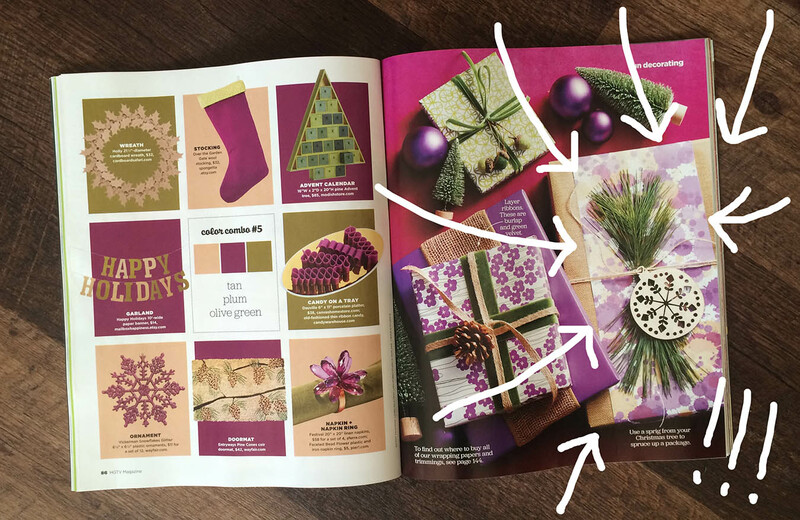 The article talks about mixing up your color palettes and our wrap is shown as a strip across a kraft box. Using a smaller amount of the sheet allows you to make a nice sheet go a long way. We love the simplicity of a kraft paper box filled with goodies secured with some washi and a color pop of wrapping paper down the middle. Simple and classy, and cost effective! 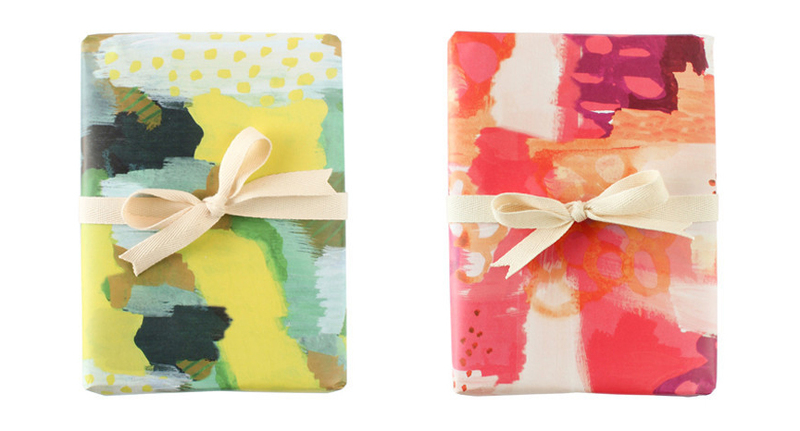 This allows you to splurge on that paper by the sheet that you fell in love with, and get a couple gifts out of it! Bring in the outdoors to finish it up with a pine topper or finish with a classic candy cane. The holidays can get a bad wrap, no pun intended, for being wasteful, but with the explosion of pinterest there are so many ideas for handmade, responsible gifts on top of companies that allow you to be conscious consumers. 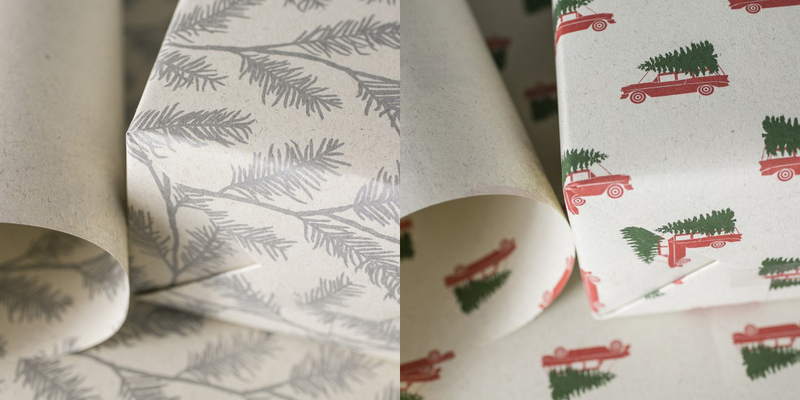 This mindset towards sustainability can translate into your gift wrap too, not compromising the final look. You can used previously worn sweaters, or scraps of felt as gift pouches by cutting 8 holes (needs to be an even number) around the periphery, like a clock. Then string twine, string, leather cord or whatever you have on hand to synch it all together. Looks beautifully crafted and is able to be reused, acting as an additional gift! Along these lines you can use remnants of felt or sturdy fabric to cut petals and string together for a striking topper. Also, you can use the leftover trimmings of ribbon, tying lengths in descending order down a stick to make a cute little Christmas tree ornament that can be easily tied to the top of a gift. Tassels are so in right now, so you could make a few with embroidery floss, but we especially like the idea of tying twine around pine needles to make a natural tassel to jazz up a gift.